I wanted to be able to reset password in Exchange Admin Center (EAC). 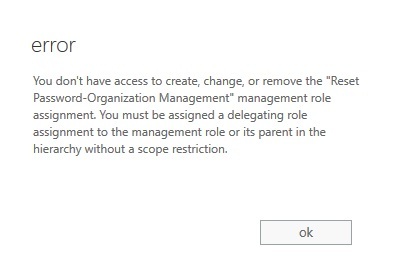 You don’t have access to create, change, or remove the “Reset Password-Organization Management” management role assignment. You must be assigned a delegating role assignment to the management role or its parent in the hierarchy without a scope restriction. So I opened Exchange Management Shell (EMS), run Add-pssnapin Microsoft*, Install-CannedRbacRoles & Install-CannedRbacRoleAssignments to reinstall RBAC. Exit EMS. Login to EAC, I was able to add Reset Password role for Organization Management. Click on Recipients, mailboxes, double-click on any email account. The Reset Password option is shown in General tab.